Toulouse, La Ville Rose, the “Pink City”, deep in the south west, is one of the venues for Euro 2016. Wales played there on June 20th. of the European aerospace capital. And there is wonderful eating as a bonus. If you don’t have the budget for drinks at a café in St Mark’s Square, Venice, this is the affordable substitute. 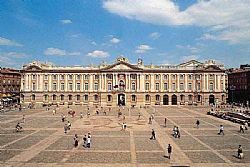 Toulouse’s Place du Capitole is one of the great city squares of Europe. There’s a vast car-free space for strolling, and people watching, and a one of those immense old civic buildings the French do so well as a backdrop. 140 yards long, there’s room for the opera house (Théâtre du Capitole) as well. Find a table at one of the many cafes, and order pre-dinner drinks. Then call back for a nightcap, when the square is decoratively lit up, as are many of Toulouse’s public buildings and bridges. Sputnik launched in 1957, a big hunk of Moon rock, and original sections of the Russian Mir craft and the Space Station. There are enough intelligent displays and hands on exhibitions to fill a day. But a minute is long enough in the gyroscope, where you are hurled upside down and back to front for the 360 degree spin dryer treatment. Then sit back and gaze at the universe in the state of the art planetarium. There’s a temporary exhibition at the Cité de l’Espace, until 31st August 2016, entitled “Space, what a story! The dream, the exploits”. grew rich trading woad, the same blue dye Julius Caesar saw the ancient Britons wearing. This was no ordinary hotel. Our taxi driver took an enormous circuit to find the only way in, up a one-way street as narrow as a Pyrenees Pass. The Hotel Garonne hides away, down below the ancient bridge over the river, just off the city centre. It’s so tiny and intimate, they serve you breakfast on a big tray in your room. Reception doubles as the bar. Ten strides over the narrow street is the hotel’s own Restaurant le 19. This former medieval fish cellar is all wood panels and terracotta bricks under a curved ceiling. Submit to whatever delights are on the menu, e.g. cream of watercress soup with warm oysters; magret of duckling with ginger and crushed apples; baked red snapper with spider-crab sauce; saffron-flavored sabayon with ice cream made from unpasteurized milk. industrial culture” which asking such questions as “The Earth is round. But is Space curved? The Euro 2016 football stadium is in the heart of the city, on the Ile du Ramier. It was entirely renovated for the championships. café Le Dauphin (city centre): on display are posters, press cuttings, flags, signs and billboards recalling the history of this illustrious club. to the public for the first time. best patisserie in town. They take the finished meal in a Toulouse apartment. The Tourist Office offers architectural walks, taking in department stores, markets, museums and homes, all created or transformed by renowned architects, from 1945 until now. Saint-Romain priory, the Jacobins Convent and Maison Seilhan. Previous PostLille – French city transformed by high speed train	Next PostIs Lyon an easier version of Paris, with better food?